How does innovation affect growth and development? Why do some entrepreneurs succeed in innovating while others fail in developing countries? How does the institutional environment shape innovative activities? These are among the questions tackled in a new book (edited by by Adam Szirmai, Wim Naudé and Micheline Goedhuys) that presents empirical evidence from developing countries such as Ethiopia, India, Turkey and Viet Nam as well as advanced economies like Finland. 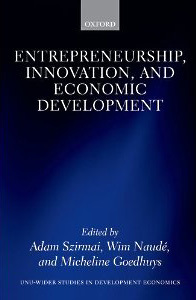 The book, Entrepreneurship, Innovation, and Economic Development, published by Oxford University Press, is the result of a collaborative project between UNU-MERIT and UNU-WIDER. For more information, including a link to the publisher’s website, profiles of the authors and a related UNU-WIDER article, see the book announcement page on the UNU-MERIT website. Entrepreneurship and innovation are two of the most pervasive concepts of our times, yet there are still gaps in our understanding of the interactions between entrepreneurship and innovation, particularly in developing countries. This book is an attempt to fill this gap. It focuses on the entrepreneurship-innovation-development nexus, drawing heavily on empirical evidence from developing countries. Cross-country and individual country experiences cover nations as diverse as Ethiopia, India, Turkey and Viet Nam, and also examine lessons from advanced economies such as Finland.